THE FLATS – Paul Haley and Vincent Whaley earn playing privileges on the Web.com Tour for 2019 via the finals of Q-School last week … Georgia Tech well represented at this week’s PNC Father-Son Challenge … This and more in the Georgia Tech #ProJackets Golf Report. Georgia Tech will have two alumni competing on the Web.com Tour in 2019 after Paul Haley and Vincent Whaley finished among the top 45 competitors after 72 holes at the finals of the Web.com Tour qualifying tournament in Chandler, Ariz. They replace the class of 2018, in which three Yellow Jackets – Anders Albertson, Roberto Castro and Seth Reeves – earned their PGA Tour cards for 2018-19. Haley, a 2011 Tech graduate who won the ACC Championship as a senior, tied for 16th place, closing with a 64 in the final round to finish at 21-under-par 267 at the Whirlwind Golf Club. Whaley, a 2017 Tech graduate, shot 67-67-67-68 to tie for 25th place at 19-under-par 269. Under the qualifying rules, both players are guaranteed eight starts in the 2019 season, which begins in January. For Haley, his performance puts him back on the Web.com Tour for the first time since 2015. He has played 48 events all-time, earning more than $275,000, and captured the title in the 2012 Chile Classic. Whaley is fourth in earnings with nearly $50,000 on the Adams Pro Tour in 2018, finishing runner-up twice and posting four other top-10 finishes in 12 starts, while Haley ranks 27th with $20,000 and five top-20 finishes. J.T. 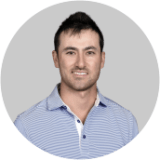 Griffin, also class of 2011, who had nine starts last year on the Web.com Tour, making six cuts, was Tech’s third competitor in the finals, but will have only conditional status on the tour in 2019 after tying for 74th place (14-under 274). PGA Tour: Matt Kuchar and his father, Peter, are in the field for this week’s PNC Father-Son Challenge, Dec. 14-16 in Orlando, Fla. Georgia Tech’s two Open champions – Stewart Cink and David Duval – are also in the field, each having won a title in the event’s history. Cink will play with his son Connor, while Duval will compete with his son Brady. Former Tech player Michael Hines (left), who caddies for PGA Tour rookie and teammate Anders Albertson, was on the bag for Vincent Whaley (right) in the Web.com Qualifying Tournament.